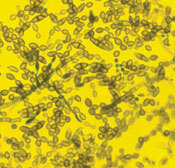 Magnified mold spores, courtesy the EPA. The author of this essay has no expertise on book preservation. The essay is simply reporting information gathered from the Internet related to the preservation of books. If you have a significant investment in your library, we suggest that you hire a qualified expert to advise you on preservation matters. We cannot be responsible for any financial or other loss as a result of anyone acting on the data in this essay. The owner of this web site, the Ontario Consultants on Religious Tolerance, currently has a collection of almost 3,800 books which deal, directly or indirectly, with religious topics. Together, these books represent an investment of tens of thousands of dollars -- a large amount for an organization like ours that operates on a very small budget. We were concerned about the preservation of our books -- particularly the prevention of the growth of mildew or other molds. Mildew often forms in house basements, such as the one where our office and library are located. "Mould is a type of fungus. It grows on surfaces in masses of branching threads which resemble dense cobwebs. The fertile threads, those which produce spores (minute reproductive cells), often stand up from the surface into the air to release their spores. Spores are carried by air currents or by adhering to insects or animals. Active mould can be any colour, depending on the species and what it is growing on." "Mildew is another type of fungus, similar in structure to mould, but distinct as one species of fungus is distinct from another, such as yeasts, rusts, and mushrooms. The terms "mildew" and 'mould' are most often used in the common names of various fungi, but they are not interchangeable." We plan to initially monitor all four data points a few times a month. If the RH values get too high, we will investigate what corrective actions we can take. We will regularly inspect our books for mold or mildew. Books should never be shelved directly against an outside wall. Moisture can develop on such walls and locally increase the RH. Have few or no houseplants near the books. For libraries below grade level, have the outside walls waterproofed. Maintain adequate air circulation in the library. In case of a flood in which books become soaked, "If you don't have the time to clean and dry them immediately, consider putting them in the freezer to prevent mildewing. Place wax paper between layers of paper bundles or books so they can be separated easily when removed." 7 This report also suggests ways of drying and treating wet books and papers. We found by accident that a magazine -- and presumably a book -- should not be placed on a concrete floor in a basement. We had a stack of magazines sitting on the floor and the bottom ones became mildewed. We suspect it was caused by underground moisture escaping into the basement. Radio Shack® Model 63-1032. It runs on two AA batteries. Pam Atteberry, "Removing Cigarette Smell," at: http://www.cgrove417.org/ This is a collection of home remedies by a librarian, most of which refer to removing mildew smell from books. This is a Word document. A free reader is available. "Appendix C: Moisture, Mold and Mildew," Environmental Protection Agency, at: www.epa.gov/ This is a PDF file. A free reader is available.